GLOBE: An organization dedicated to the study of culture, leadership, and organizational effectiveness. The 2018 Robert J. House Best Paper Award call for papers is out! Generously sponsored by University of Victoria’s Peter B. Gustavson School of Business, the award will honor outstanding work on leadership, societal or organizational culture using the GLOBE database, GLOBE research tools, GLOBE leadership and/or GLOBE culture theory. In addition to the prestige of this competitive award, the recipient will also receive a US$ 2,500 cash prize. 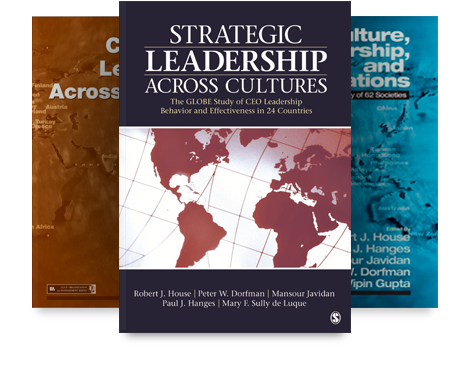 As GLOBE prepares to undertake a new phase of research ("GLOBE 2020"), our most recent book, Strategic Leadership Across Cultures: The GLOBE Study of CEO Leadership Behavior and Effectiveness in 24 Countries, offers essential reading for anyone studying or practicing in the fields of global leadership, cross-cultural leadership, international business, and organization studies. Readers have found that the content and methodology detailed in the book are uniquely accessible for a variety of backgrounds, and thus provide a useful and approachable bridge from GLOBE Phase 3 to upcoming GLOBE 2020 (Phase 4).